Viking’s fun Wilmington Watch Them Play! program will introduce sports and games to our youngest “athletes”. 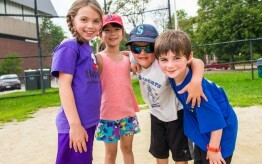 Children and their caregivers will participate in supervised group activities combining sports and play, with an emphasis on coordination, gross motor development and listening skills.. All players receive a Viking Sports T-shirt. Our areas of primary focus is general awareness, gross motor development, and reinforcement of fun and positive play. We incorporate fun skills games to help build up confidence, listening skills, and coordination for all students in class during each session. Our coaches are excellent at incorporating levels of skill and making sure all children in each class receive an equal amount of attention to remain engaged in every class.